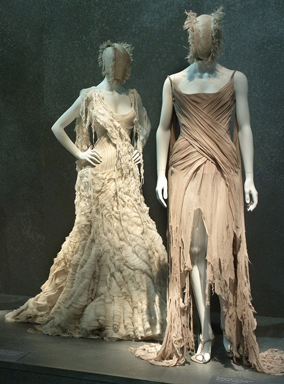 For those of you who have sight, run—don’t walk—to the Alexander McQueen retrospective “Savage Beauty,” unfortunately in its final weeks at the Metropolitan Museum of Art. It’s like Disney World for anyone who is morbidly curious with design sensibilities. The pure imagination that exudes from the series of galleries surely justifies the one and a half hour wait at the entrance. It had buzz and excitement like the line to get into the latest installment of the “Twilight” franchise, only here the anticipation builds to something good. Love him or hate him, the exhibit, with its evocative and avant-garde drama, is sure to be entertaining. If you hate him, you will have gallery after gallery of grotesquely beautiful fashion to judge and criticize. If you love him, you will love him even more. The sheer proximity to the masterful creations will give you chills down your spin (many of which are present in the exhibit). The expansive diversity and depth of detail in the designer’s body of work is almost too great to justly profile in a short blog entry, as each room elicited volumes of emotions and intrigue. 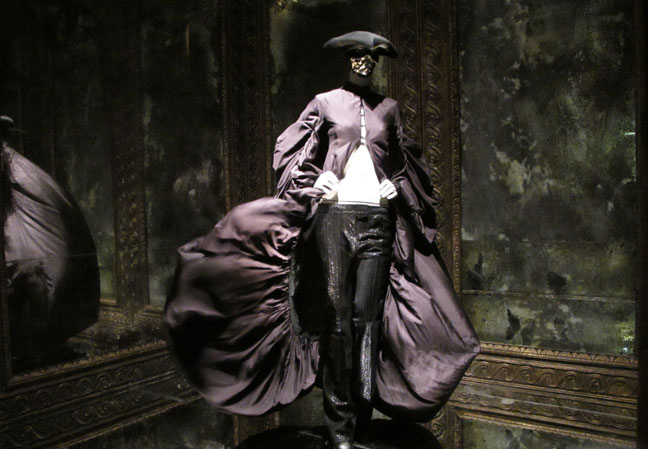 The room appropriately titled “Cabinet of Curiosities” featured a number of Philip Treacy hats created for the Alexander McQueen label, which were objects that I personally gravitated towards. The dark and mystical wonderland appeals to the deepest depths of the artistic soul—if you manage to leave uninspired, you are creatively dead inside. McQueen had an ingenious ability to borrow from other historical periods and cultures while not making the piece look too much like a costume, but rather fresh, innovative, and avant-garde. The sophistication and reverence with which he approached his inspiration is unparalleled. From the raw grit of nature to Gothic Romanticism to ancient philosophical texts fused with the ultramodern, the eclectic details are part of what give the show such originality and splendor. 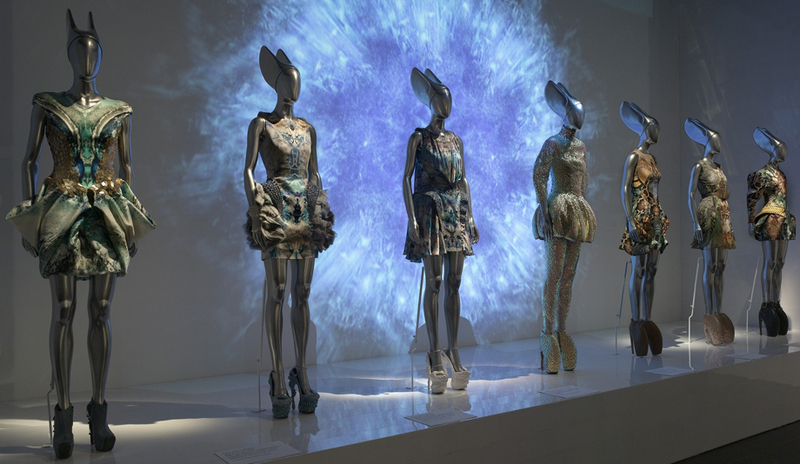 The pure imaginative theater is a clear departure from the work of contemporary designers and part of what made McQueen such a bold and refreshing voice in the industry. 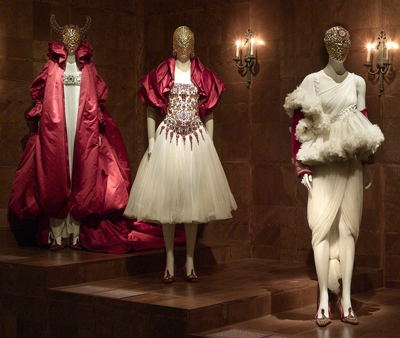 The theatrical quality of the work extends beyond the individual pieces to McQueen’s infamous fashion shows, they themselves performances and commentaries on nationalism and societal perceptions of beauty (and thoughtfully injected into the exhibit through video and the galleries’ environments). A vital, theoretical component to McQueen’s work that many people overlook when entranced by the jaw-dropping visual of the aberrant fashion is the impact of philosophy. The designer’s fascination with the beauty of death and his complex ideas about the natural phenomenon are constantly present in the designs. This is not only seen in the dark color palette and macabre imagery, but also in the assertive beauty with which he treats the theme and its representation in the clothes. 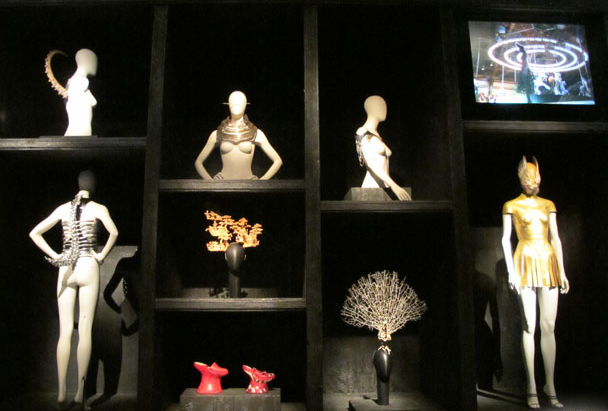 This philosophical thread is woven into the exhibit by quotes from McQueen himself, which annotate each group of mannequins and give the exhibit an eerie posthumous personal edge. In the end, the exhibit is expertly curated by Andrew Bolton, and a fitting and tasteful celebration of the late designer. Now I just wish there were more Lady Gagas among us to wear these fascinating creations for the world to see.